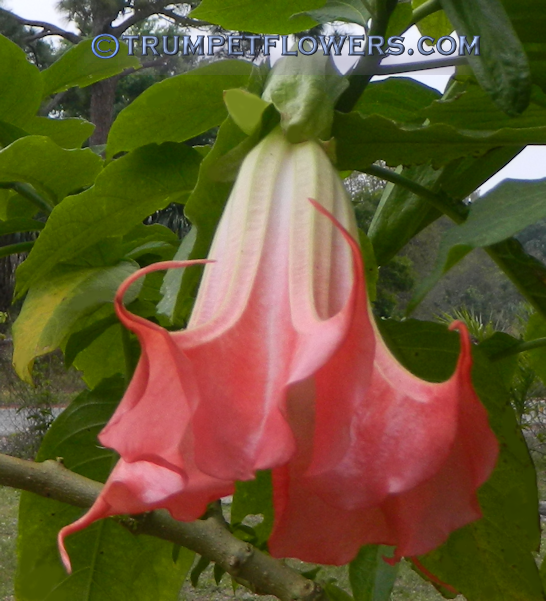 This stunning bloom of Pink Dragon Brugmansia is deep fushia in shade, and shows up on a cold winter day. 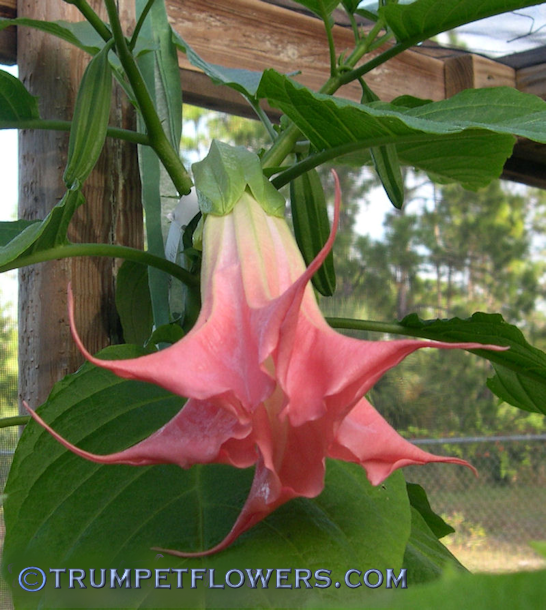 Brugmansia Pink Dragon is a gorgeous single bloom, that is wide mouthed and full of pollen. 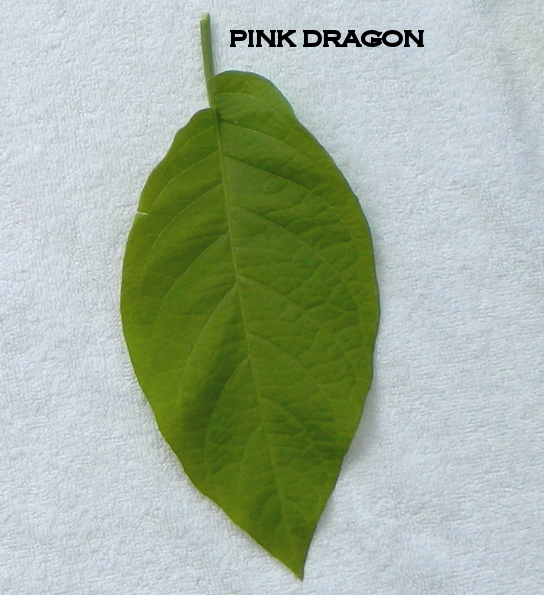 Pink Dragon has shiny green leaves. 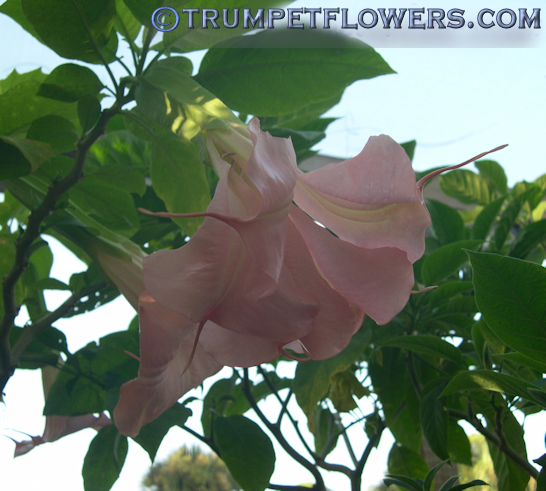 Parented by First Day X Rosabelle, created by Susie French and seedling parent is Mary Usina in the USA. 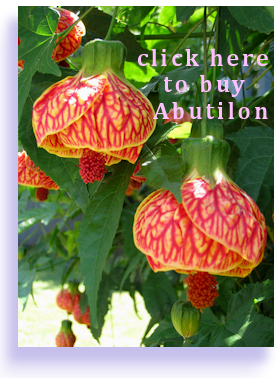 Published in 2005. 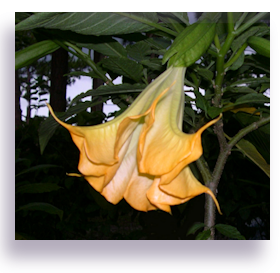 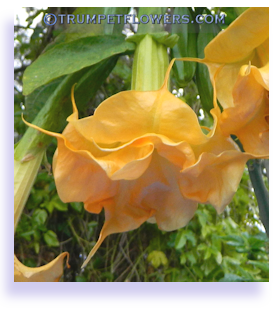 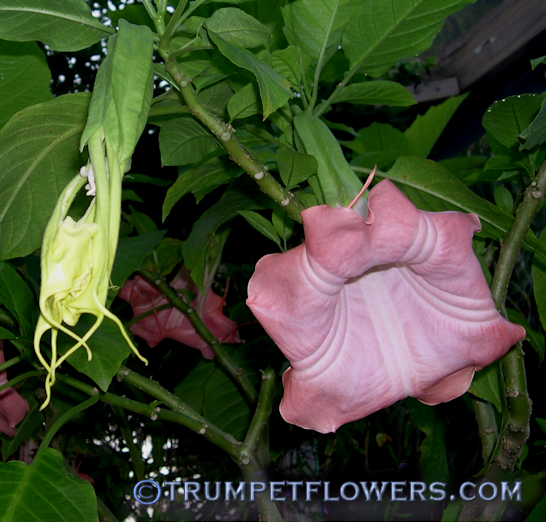 Brugmansia Pink Dragon blooms smell like spicy fruit, very strong scented, especially in mornings and evenings. 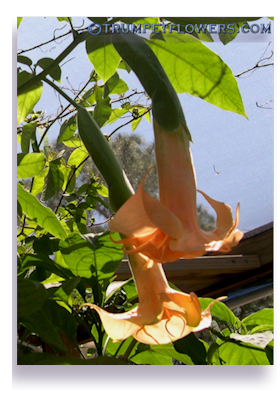 The spice scent is known to occur in very warm, even hot summer days. 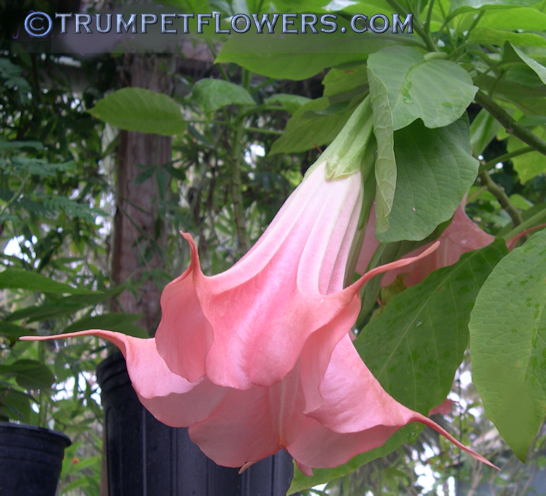 But in the cool of winter, the fragrance becomes more typical of trumpet flowers usual scent, which is strong baby powder, at least from our observation. 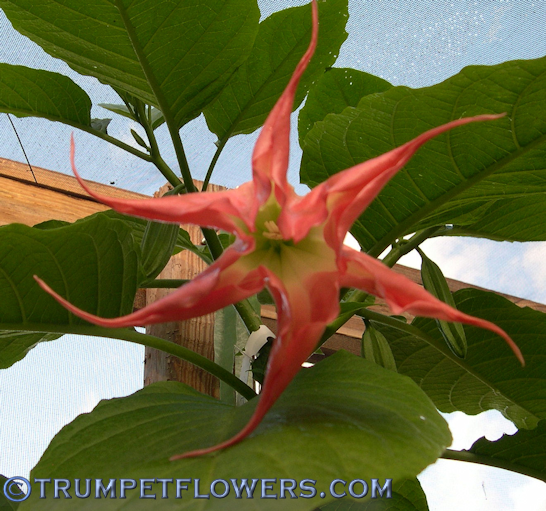 Sometimes in the harsh summer heat, Pink Dragon throws some shredded blooms. 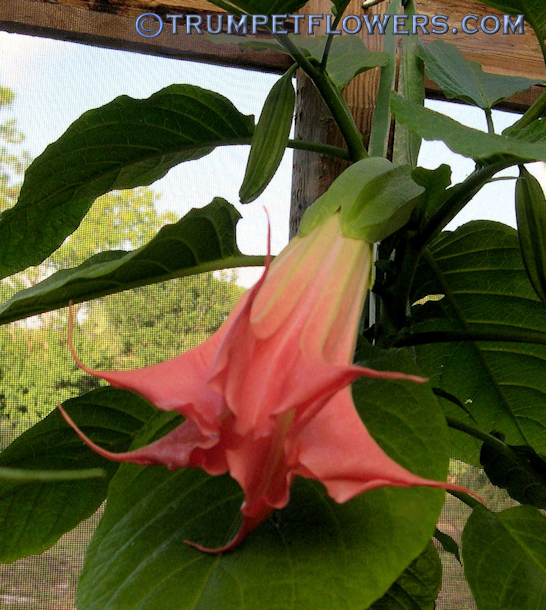 Note the new, unopened flower on the left above. 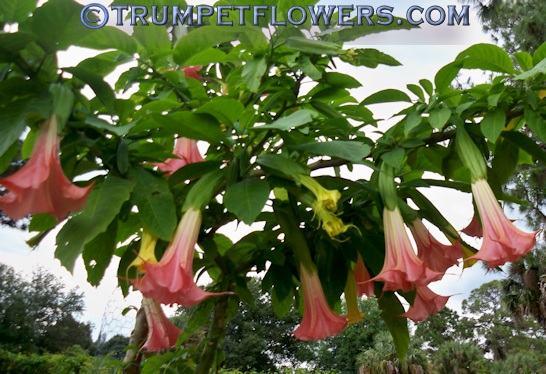 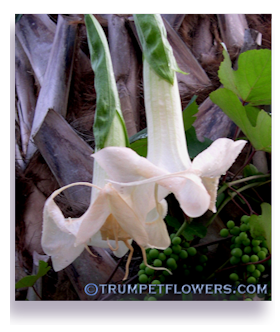 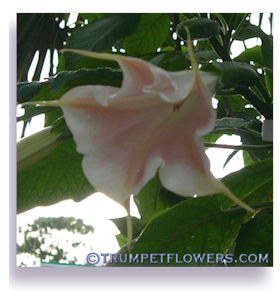 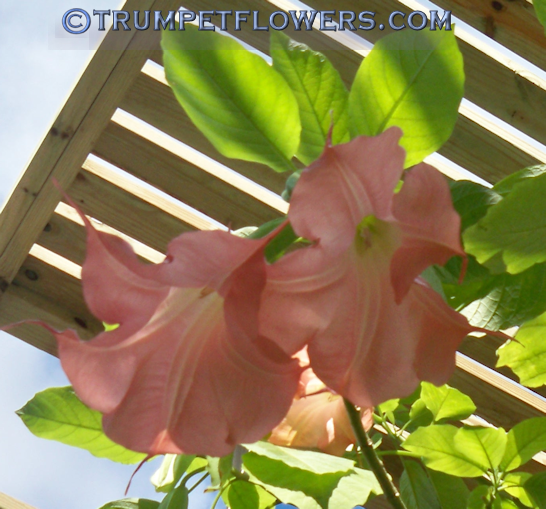 Brugmansia Pink Dragon is a vigorous growing Angels Trumpet, and gets quite large in under a year&apos;s time. 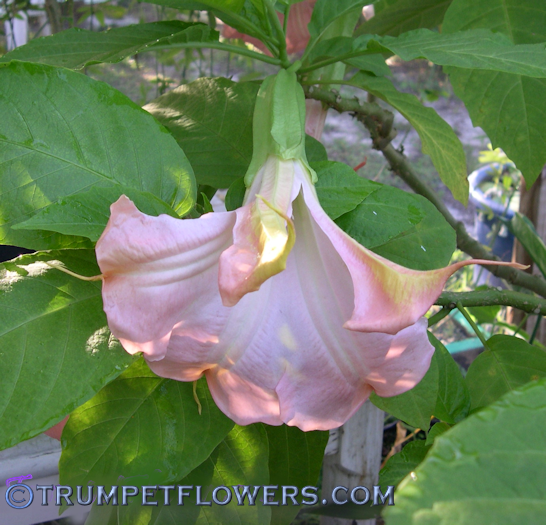 Mine is just now one year, and is 5 foot tall, with a trunk diameter of 2 inches. 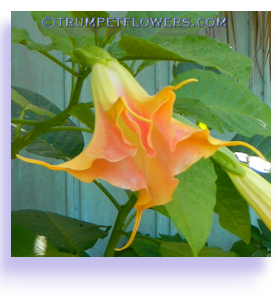 A gift from a very dear friend of mine, Edna; this is one of my best blooming and favorite of brugmansia. 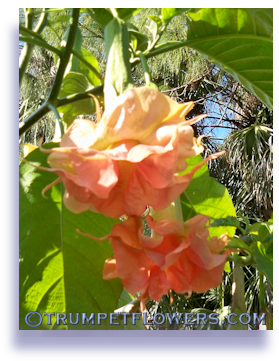 I even gave him a huge, tree forming raised container bed so he can reach his full potential. 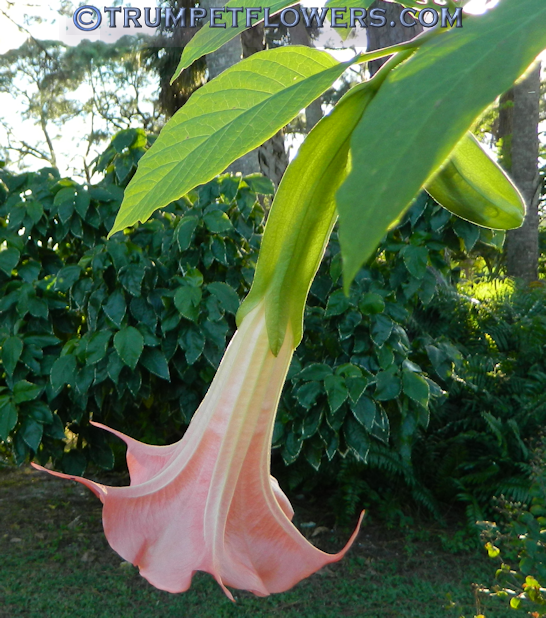 Don&apos;t ask me why I call it male, it just reminds me of that. 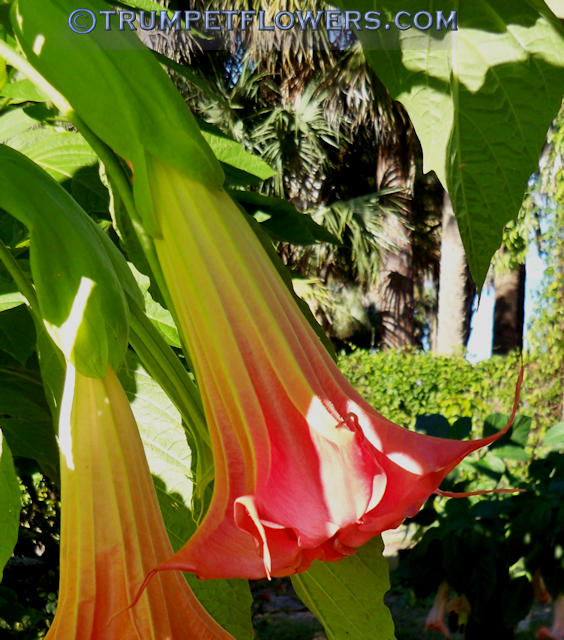 Perhaps it is the name the name Dragon that influences my thoughts on this. 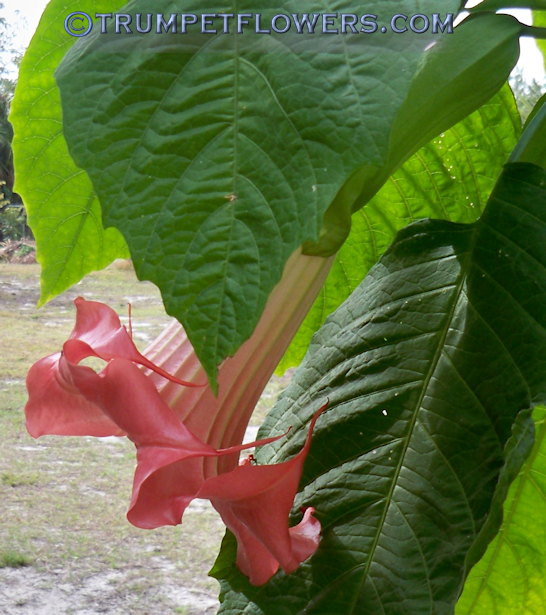 Pink Dragon in the foreground, set against a large acalypha in background. 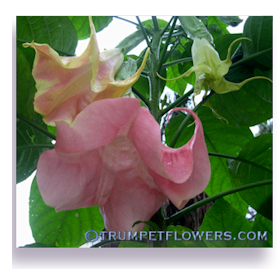 Brugmansia Pink Dragon shows different colored blooms depending upon the time of year. 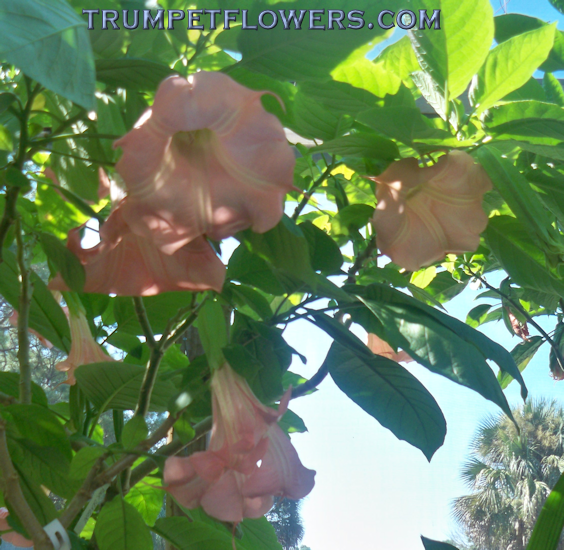 Cooler weather usually brings me darker colored blooms on brugmansia Pink Dragon, although the coolest of days we&apos;ve had this early 2013, have thrown some paler shades. 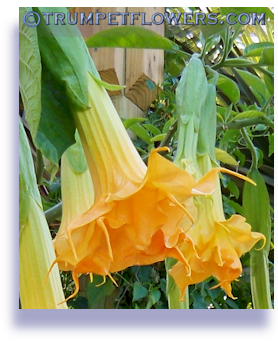 I guess one never knows! 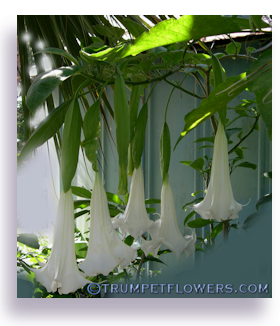 Here he goes again. 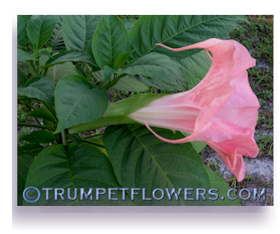 It&apos;s March 6th, 2014, and Pink Dragon is going to make a nice flush within the next week or so. 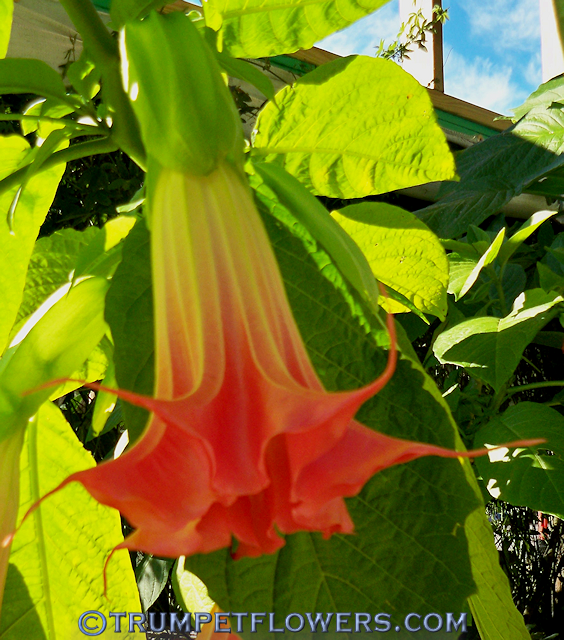 The first bloom to open is that nice, bright, almost red. 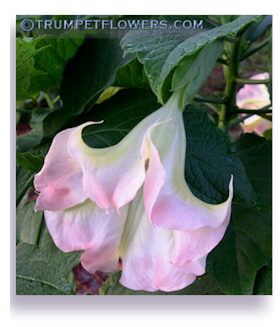 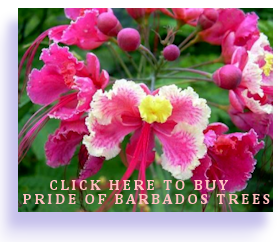 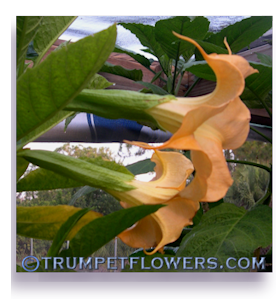 Pink Dragon Angel Trumpet has large, shiny, bright green leaves with a slight leathery feel to them. 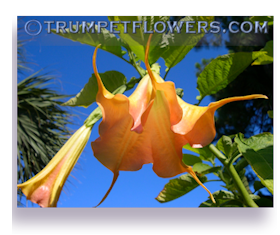 This entry was posted on February 10th, 2012 and is filed under Brugmansia Gallery.